NYC Snake Ambassadors Dewey Dawson and Mike Richardson will bring surprising serpents to your birthday party. 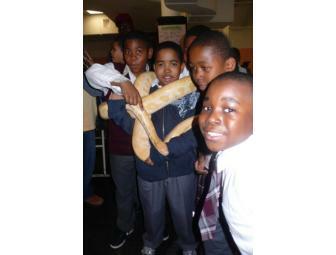 Party-goers can touch the snakes, and learn all about how they help the environment, their habitats, and what they eat. Anything you want to know about herps, Dewey and Mike know. They'll take polaroids on the spot of children with snakes as take-home party favors! Your support matters, so Seeds in the Middle would like to use your information to keep in touch about things that may matter to you. If you choose to hear from Seeds in the Middle, we may contact you in the future about our ongoing efforts. Copyright © 2003-2019 Seeds in the Middle and BiddingForGood, Inc. All Rights Reserved. Designated trademarks and brands are the property of their respective owners.